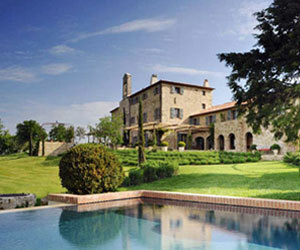 Villa San Paolo is one of ten 5-star luxury villas available to rent on a private estate of Castello di Reschio. This private estate covers 2,000 acres of Umbrian countryside with expansive views of rolling hills, olive groves and vineyards and forests of ancient oak and chestnut trees. Little has changed since St. Francis of Assisi preached here in the Middle Ages. This 17th century farmhouse, rectory and chapel has been painstakingly converted into a beautiful villa and independent but attached guest cottage and a detached pool house with guest suite. Reached by a gravel road, it has breathtaking 360° views. The gardens are extensive, with ancient olives, an 18m x 4.5m overflow swimming pool overlooking the Reschio estate, several outdoor sitting and dining areas and a pool house. The ground floor gives entrance to the chapel, wine cellar, boiler room and the main entrance. From the main entrance is a large living area that over looks a formal Italian garden and features a piano. There is access to the main professional, open kitchen with a bar area and dining room. Also on this floor is TV room, laundry room, and a cloak room. Up the stairs, there is a host of bedrooms. First is the master suite which includes a double bedroom an en suite bathroom with a double shower and free standing bathtub, a dressing room, and an external staircase to a private terrace. Two more double bedrooms with dressing rooms and en suite bathrooms, a single bedroom with en suite bathroom, and a reading area round out this floor. Up another flight of stairs lies a double bedroom with dressing room and bathroom and access to a large study with a fireplace. Enter into the pool house to find a double bedroom with bathroom. From there one can make their way to the kitchenette and pool bar, the lounge, bread oven, changing room and bathroom. • This villa is not suitable for young children.